Why might the NFL be on its way to becoming MLB? Because the NFL is looking at a 2021 season that may not even be played. Because the NFL’s ostensibly mainstream stars — Tom Brady, Drew Brees and Eli Manning — who have dominated the past decade, are getting old. And many kids are being steered away from playing the game in its tackle form. “Participation has dropped,” Mark Murphy said in January. He’s president and CEO of the Green Bay Packers and a board member at USA Football. “There’s concern among parents about when is the right age to start playing tackle, if at all.” In a recent (nonrandom) study of NFL players, 110 out of 111 brains examined showed signs of the degenerative brain disease chronic traumatic encephalopathy (CTE). But the NFL could spiral mostly because, perhaps more than at any other time in pro football history, the league is at a crossroads when it comes to race. League news right now leads with racial conflict. Players are protesting. NFL commissioner Roger Goodell and owners are somewhere between demanding and begging them not to. And in the middle, fans fight over whose boycott of the NFL is actually having an impact on the ratings, if any at all. Free agent Colin Kaepernick, to bring attention to systemic racism and police brutality, opted on Aug. 14, 2016, not to stand for the national anthem. This has placed the NFL at the center of a discussion about race and sports. Kaepernick’s protest has spread around the world, from European soccer games to Midwestern high school football games. By most accounts, the NFL has botched the handling of the protests. A year later, Kaepernick isn’t in the league despite evidence of him being good enough to start on some teams, and he could surely be a backup. The reason the anti-protest backlash has become so impactful for the black community is because there’s an understanding of what the fervor about protests is really about—silence. There are contradictions in just about every sentiment of outrage about the protests. Just look at the viral image of an NFL fan wearing a “I stand for the National Anthem” shirt while sitting on a flag. And at the fact that the NFL didn’t even start requiring players to stand for the Anthem until 2009—after the Department of Defense paid the league $5.4 million for “paid patriotism.” And at the fact the NFL actually violates flag codes in some of their representations of patriotism. Jerry Jones himself sat during the anthem at his first Cowboys game, in 1989. And Donald Trump’s finger-pointing at players (and owners) doesn’t erase the fact he insulted John McCain for being a prisoner of war and has lied about calling Gold Star military families who lost soldiers in battle this year. The anger over protests isn’t about patriotism, it’s about silencing black athletes. Steps the NFL may or may not make to quell protests will be seen as an endorsement of that silence. On Oct. 15, Kaepernick filed a formal grievance against the NFL alleging collusion by team owners. “I think he should be on a roster right now, the Packers’ Aaron Rodgers said in August. “I think because of his protests, he’s not.” Jay-Z rocks a custom Kaepernick jersey on Saturday Night Live, and his actual jersey leads the 49ers’ sales, even though he hasn’t taken a snap for them this season. Kaepernick’s likeness rules the streets. All the while, Kaep rarely speaks, instead continuing his push to donate a million dollars of his own money to various charities across the country, volunteering to donate backpacks to students and suits to parolees. Without so much as a news conference, Kaepernick is part of a daily news cycle, thanks to a massive social media following that watches his every move. The NBA, its individual players, and fan community have used social media to become a 12-month sport. 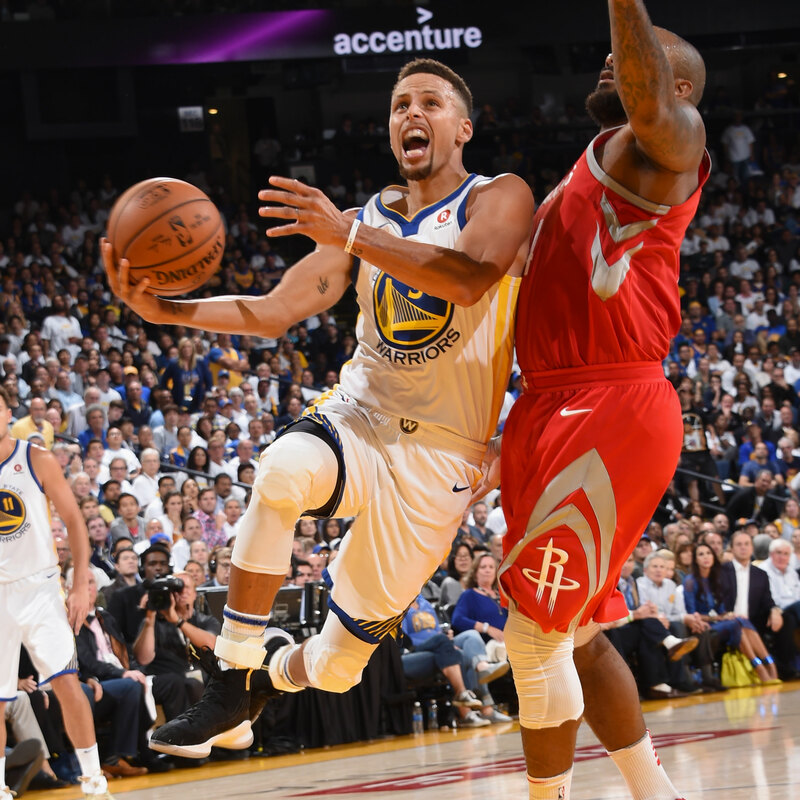 Stephen Curry #30 of the Golden State Warriors goes to the basket against the Houston Rockets on October 17, 2017 at ORACLE Arena in Oakland, California. And that’s where the NBA dominates the NFL: at social media, where everything is happening. On Facebook, Instagram and Twitter, NBA teams have an average of more than 7 million followers, while NFL franchises average 4.6 million. Even during the NFL’s last season, there were more hashtags on Twitter dedicated to the NBA. In 2016, Forbes ranked the top athletes on social media: Four of the top 10 players were from the NBA, and the rest were international soccer stars. NFL players didn’t crack the top 10. The NBA social media connection allows players to enter lives and households in new and intimate ways. Another major reason for the NBA’s ability to lap the NFL in social media is the NFL’s draconian rules about sharing videos online. Last October, the league sent out a memo barring teams from posting clips or GIFs of games. Teams that did so would be fined up to $100,000. While teams such as the Atlanta Falcons use clips from Madden video games to “show” highlights every Sunday, the NFL’s hard line limits many teams’ ability to deeply connect with fans where they are — which is, so much of the time, on their phones. The NFL’s limits on social media, and teams’ subsequent mockery of the decision, exposes a blind spot about American culture. African-Americans dominate what’s trendy on social media, and if “Black Twitter” determines that something is viral, it often becomes an American cultural phenomenon. Think of phrases such as “lit” and “on fleek” or crazes like the mannequin challenge — these began in blackness. On any given week, a new black-centered sensation, such as the NSFW #ForTheD challenge that dominated social media last month, takes over the country. The NFL had that viral moment with Cam Newton doing his signature dabbing celebration in 2015, but he was as chastised for it as he was celebrated. Letters were written to newspapers about his “pelvic thrusts,” and Newton’s “arrogance” became the center of the story. And after a humbling Super Bowl loss to the Denver Broncos, Newton seemed put in his place. Instead of embracing him, the NFL demonstrated that it didn’t understand what moves the needle in American culture. It cut down one of its viral superstars — something the NBA just doesn’t do. “Diversity is very important to us,” said the Hawks’ Wilson. “We know our demographic, and our audience, and it is about keeping up with those trends. We always think about how can we tap into diverse communities while trying to push ourselves forward.” It affects the Hawks’ bottom line significantly. The organization has taken things a step further by offering a full-on embrace of Atlanta music: acts such as T.I., Gucci Mane and Big Boi perform at halftimes throughout the season, which has resulted in increased ticket sales and price inflation every time a concert is announced. The Hawks’ Philips Arena is even now home to rapper Killer Mike’s Swag barbershop. The NBA understands that rock is no longer the dominant genre of music. Last year’s Finals marketing soundtrack featured songs from Kendrick Lamar’s DAMN. while the NFL featured the return of Hank Williams Jr. — who was dropped from ESPN’s Monday Night Football six years ago for likening President Barack Obama to Adolf Hitler. And while the NBA features a list of rap stars and rhythm and blues singers during All-Star Weekend festivities, this year the Super Bowl will feature Justin Timberlake, whose last, 2004 Super Bowl performance featured him pulling off a piece of Janet Jackson’s clothing, exposing her breast. Whether or not the move was planned, it went awry, and Jackson caught the backlash as Timberlake’s career flourished. These kinds of things resonate, and the NFL’s de facto pardoning of Timberlake is another reminder to the black consumer that the league doesn’t cherish their concerns the way the NBA so often does. Yet, even as black America is ravaged by socioeconomic disparities, a 2015 Nielsen study explains that we’ve reached a tipping point with regard to black economic influence. “Today’s American mainstream is rapidly changing, and that change can be attributed in part to the growth and activities of African-Americans in the marketplace. Social media and the internet have become go-to communications platforms for African-American stories and content.” The study goes on to state that black consumer power is growing at unprecedented levels, reaching $1.2 trillion in 2015, a 275 percent increase from 1990. So the appeal to the black consumer is about more than just what’s “cool.” It’s about a consumer base that is increasingly vital. The NBA season kicked off last Tuesday with a display of the chokehold professional basketball has on compelling storylines. LeBron James faced off against his former teammate and passive-aggressive foe Kyrie Irving. The Warriors lost a buzzer-beater to the newly constructed Houston Rockets that now boast Chris Paul — all while a Klay Thompson doppelgänger was the social media joke of the night. But the NBA’s offseason was almost as entertaining, full of memed stories and social media buzz, from the petty feud between Irving and James to Thompson’s Ferris Bueller’s Day Off-like adventures in China, Hoodie ’Melo and Kevin Durant’s bizarre Twitter dramas. The NBA, its individual players and fan community have used social media to become a 12-month sport. Meanwhile, the NFL is years-deep into a seemingly never-ending barrage of Spygate, Bountygate and Deflategate. There was the Ray Rice domestic abuse case. Accusations about covering up CTE analysis. All of this, though, seemed only to slightly dent the NFL’s impenetrable shield: People seemed to have accepted the judge and jury status of Goodell, the misogyny and abusive history of too many players who continue to play despite domestic abuse cases, and folks kind of knew that playing football was damaging to athletes in the long term. But Kaepernick’s protest and its fallout illuminated a sharp and deep conflict within the NFL—and among its fans—that many weren’t expecting. An Oct. 11 study by The New York Times makes clear that the NFL is now one of the “most divisive” brands in America. The league doesn’t have to choose between its black players and white audience, but it does have to find a middle ground between black players and fans, and its white fans, a dilemma unique to the National Football League. The NFL is the only major male American sport that has mostly black players and a mostly white audience. The NFL is 67 percent black, but its audience is measured at 77 percent white. And although the league is two-thirds black, its top stars are white. In 2015, seven of the NFL’s nine top endorsement earners were white. Since then, black athletes such as Cam Newton and Odell Beckham Jr. have stormed the top ranks, but endorsements largely focus on quarterbacks. The New York Giants are the only team in the NFL that has never started a black quarterback. Of the 32 teams in the NFL, there were six black starting quarterbacks as of Week 7. But by the time of the 2021 labor negotiations, the aforementioned Brady/Brees/Rodgers/Manning quadrumvirate will be out of the league. Andrew Luck, Derek Carr and Marcus Mariota are the quarterbacks most poised to be the league’s next torchbearers, and with them are Russell Wilson, Jameis Winston and Dak Prescott. So what happens when the faces of the league are as black as the rest of the players? How the NFL reacts will determine the future of the sport. Major League Baseball and the National Basketball Association have both been at the same racial crossroads. One league offers the NFL a blueprint for success, and the other a cautionary tale. The NBA has had multiple eras in which it has had to realign based on demographics and its top stars. In 1979, three years after the NBA merged with the ABA, the league had a nearly identical demographic makeup as the NFL. Seventy-five percent of the NBA’s players were black, up from 60 percent a decade before, and only two of the league’s top 20 scorers were white. At the same time, 75 percent of the audience was white. Attendance was down, as were ratings, to the tune of a 26 percent decrease against the previous season. A 1979 Sports Illustrated article titled There’s An Ill Wind Blowing For The NBA laid out the question plainly: Is the NBA too black? There was a time when it seemed impossible for major league baseball to fall out of favor as the leading American sport. The league also lucked up by being able to lean into its racial divide with a ready-made rivalry between the bombastic and very black Los Angeles Lakers, led by Magic Johnson, and Larry Bird’s Boston Celtics. Stern, to his credit, embraced the clash, marketing the rivalry and letting the racial subtext become one of the main storylines. The league rode that popularity through the ’80s and ’90s with respectable black stars like Michael Jordan who didn’t upset the American status quo. Jordan was, in many ways, the perfect black athlete for corporate America. He stayed out of politics, seemed nonthreatening, and was a money machine. Then came the NBA’s next racial crossroads: Allen Iverson. AI, the anti-Jordan, had cornrows, tattoos, jewelry — and he just did it his way. Iverson tested the limits of Stern’s acceptance of black culture. Iverson was from the ’hood, had been embroiled in a nasty fight before going to college, and didn’t bother cleaning up his language. While the NBA struggled with Iverson’s imaging, Reebok embraced his persona, tying their AI shoe to urban culture. They called it The Answer, and it was a monumental success. A generation of athletes looked up to Iverson. And as those players mimicked his style, the NBA cracked down. In 2005, Stern instituted a dress code for the NBA, making players drop the baggy clothes and dress business casual. LeBron James, just entering his third year, was amenable to the change: “No it’s not a big deal, not to me.” The usually reserved Tim Duncan had stronger thoughts: “I think it’s a load of crap.” Of course now NBA players are the most style-forward athletes in the world. Every night is a runway show. In 2014, when a tape of the Clippers’ then-owner Donald Sterling uttering racial slurs leaked online, new commissioner Silver was quick and decisive, issuing a lifetime ban. It was the only viable option. The fans were ready for Sterling (who had a long history of animus toward African-Americans) to go, and the Warriors’ Stephen Curry had planned on walking out during a game if Sterling kept his status. There could be no wiggle room. In fairness, the NBA had to work out many of its racial battles before the era of social media. So while the league’s virtual expulsion of Mahmoud Abdul-Rauf in the mid-’90s was just as despicable as what’s happening to Kaepernick, the league didn’t have to fight those issues in real time on social media, like the NFL does now. But it’s important to remember that there was a time when it seemed impossible for major league baseball to fall out of favor as the leading American sport. There are numerous reasons for baseball’s dwindling cultural impact: steroid scandals, strikes and shrinking attention spans. However, it’s undeniable that baseball’s lack of connection with America as a whole is directly tied to its refusal to embrace black culture. Baseball’s tacit insistence upon “tradition” and unspoken rules are all too often coded language for a refusal to accept cultural norms that aren’t firmly white American. Bat flips and celebrations are seen as being anti-baseball when they’re really bits of culture inserted by nonwhite athletes. In 2015, Chris Rock landed a scalding indictment of baseball’s popularity during a video for HBO’s Real Sports. The NFL may be gaining an understanding of its need to let black players express themselves to their fans. The league has loosened up the penalties for touchdown celebrations, which has so often been a vibrant space for black player expression and trash talk on the field. Now, players can celebrate while using the football as a prop, celebrate as a team and celebrate on the ground, which were previously 15-yard penalties. And the ESPN Twitter account promoted a Week 5 Packers vs. Cowboys game with a video of battle rappers DNA and K-Shine rhyming about their favorite teams at a barbershop. It’s a start, and a sign that the NFL is inching toward some of the cool points that the NBA snatched. But with Kaepernick still unemployed, the league, stuck in its ways, continues to scramble without a sophisticated strategy or uniform approach in place. Doomsdays. Humanity has always been obsessed with them. But the NFL is at a crossroads at a time when black culture is simultaneously as powerful, relevant and under attack as at any point in American history. What side of that history is the NFL going to stand — or kneel — on? The almighty National Football League has decisions to make, and so do its players and fans.